← Sidearm While Duck Hunting? Answer: You should check with your local police or sheriff’s department first to determine if there are any city or county ordinances prohibiting the use of bow and arrow fishing tackle. 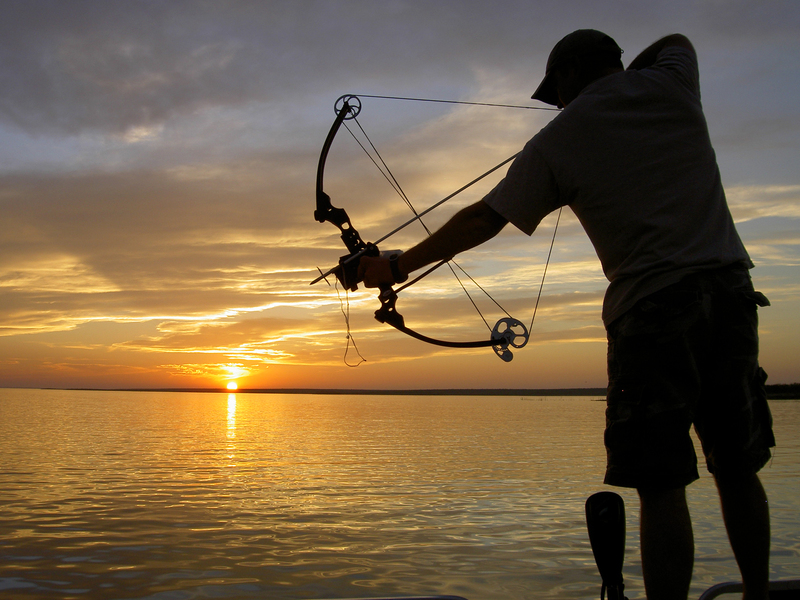 If not, it is legal to bowfish in the surf under the following conditions: Spears, harpoons and bow and arrow fishing tackle may be used for taking all varieties of skates, rays and sharks, except white sharks. Such gear may not be possessed or used within 100 yards of the mouth of any stream in any ocean waters north of Ventura County, nor aboard any vessel on any day or on any trip when broadbill swordfish or marlin have been taken. Bow and arrow fishing tackle may be used to take finfish other than giant (black) sea bass, garibaldi, gulf grouper, broomtail grouper, trout, salmon, broadbill swordfish, white shark, green sturgeon and white sturgeon (California Code of Regulations, Title 14, section 28.95, 27.90 and 27.91). Can you hunt waterfowl not listed in the regulations? Answer: The waterfowl regulations apply to all species of geese, ducks and mergansers. Coots have different regulations. As long as the waterfowl species you wish to take does not have more specific regulations than the general bag limits, then that non-specified waterfowl species can be included in your general bag. Retrieving game from private property? Answer: There are no regulations which allow you to recover game that ends up on private property. You are expected to retrieve all game you harvest and not to cause wanton waste by failing to recover something you’ve shot, but you must get permission from the landowner to legally enter their property. If you are not able to reach them for permission, you may contact the local game warden or sheriff and request assistance. Buying diamondback rattlesnakes from Texas for taxidermy? Answer: Dead rattlesnakes can be purchased and imported into California (Fish and Game Code, section 2353). You will just need to make sure the shipment comes with a completed Declaration for Entry form identifying what it is and where it’s coming from. This declaration must be submitted to the department or a designated state or federal agency at or immediately prior to the time of entry. Declaration is not required if shipped by common carrier under a bill of lading. This form may be photocopied. The original copy of the declaration form shall be retained by the person importing the fish or game into the state. One copy shall be mailed to the Department of Fish and Wildlife, 1416 Ninth St., Sacramento, CA 95814, within 24 hours after entering the state. One copy shall be deposited at the point of entry with any state or federal agency or officer, and one copy shall remain with the fish or game if transported by other than owner or common carrier. “Point of entry” refers to the city or town nearest your point of entry into California. Lobster hooping from a public pier? Answer: No, the regulations state that people fishing from a public pier can fish with only two “appliances,” so the two hoop nets and one fishing rod for fin fish would total three. You don’t need a fishing license to fish from a public pier, but anyone fishing for lobsters must have a valid lobster report card. This entry was posted in Fish and Game Code, Import/Export, Licensing/Permits/Stamps/Report Cards, Lines/Rods/Equipment, Lobsters, Methods Of Take, Nets, Pier Fishing, Reptiles, Spear Fishing, Tackle, Title 14, Transporting Taken Animals, Uncategorized, Waterfowl and tagged archery, big game hunting, fishing tackle, importation, invertebrates, lobsters, ocean fishing, regulations, reptiles, upland game hunting, waterfowl. Bookmark the permalink.